Although Cook accurately portrayed his inner psyche, our hearts joyfully remember his writings from childhood. We remember WHERE THE WILD THINGS ARE and CHICKEN SOUP WITH RICE and we’d like to honor his memory from that perspective. 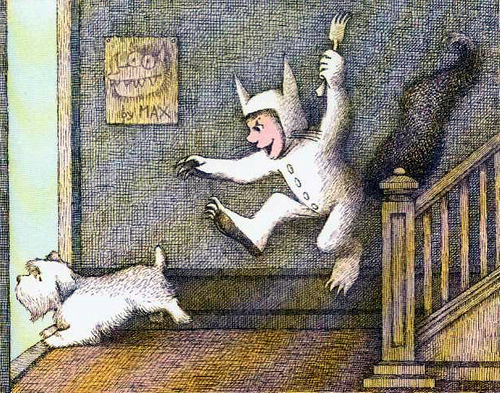 So, to Mr. Sendak, we’d like to say thank you for writing honest books for children. Thank you for exploring not only the happy parts of childhood, but the sad, scary, and real parts, too. Thank you for inspiring our dreams of dress up, sailing for over a year in and out of weeks, and wild rumpuses. You will be missed, and some day, when we’re reading WHERE THE WILD THINGS ARE to our own children, we’ll think of you and dance like the Wild Things again.  Archived in Iconic Literary Men and tagged literature, Maurice Sendak, Where the Wild Things Are, writing. Bookmark the permalink.